From 2006 to his arrest in 2010 before an alleged trip to Somalia, Elton Simpson, a suspect in the shooting at the Muslim prophet Muhammad drawing contest in Texas, was monitored by the FBI via an informant. Terror charges against him were later dropped. 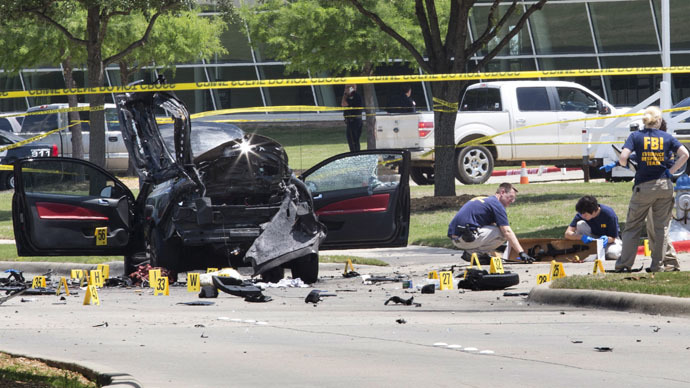 Simpson and alleged accomplice Nadir Soofi were killed by law enforcement in the Dallas suburb of Garland, Texas, on Sunday after the men shot a school district security guard in the leg outside the Curtis Culwell Center. The American Freedom Defense Initiative -- deemed by some as an anti-Muslim “hate group” -- was holding a contest for drawings of Muhammad at the facility. Depictions of the prophet are offensive to many Muslims. Simpson and Soofi, who were roommates living in Phoenix, Arizona, allegedly carried rifles and were wearing body armor. Garland police and SWAT officers were on the scene. Garland police said it was still unknown who fired the lethal shots. Born in Illinois, Simpson converted to Islam at an early age. According to court documents cited by news reports, Simpson attracted the attention of the Federal Bureau of Investigation based on his ties to Hassas Abu Jihaad, a former US Navy sailor accused of leaking details of his ship’s movements to a jihadist website. Jihaad was eventually convicted of terror charges. In 2006, the FBI sent an informant to monitor Simpson. Dabla Deng, a Sudanese immigrant, was told to introduce himself as a recent Muslim convert. Deng recorded more than 1,500 hours of conversation over the next few years, according to court records. In January 2010, Simpson was arrested the day before he was to leave for what he said were religious studies at a madrassa in South Africa. Authorities alleged he was actually planning to travel to Somalia. The accusation was based on comments Simpson had made during his monitoring. In one recording, Simpson supposedly said the studies in South Africa were "just a front" and that he would "bounce" if he needed to, the Dallas Morning News reported. During his trial, recordings were played that featured Simpson speaking of taking the fight to non-Muslims, or "kuffar." "Allah loves someone who is out there fighting [non-Muslims] and making difficult sacrifices such as living in caves, sleeping on rocks rather than sleeping in comfortable beds and with his wife, children and nice cars," Simpson said in an informant-taped recording. "If you get shot, or you get killed, it’s [heaven] straight away…That’s what we here for…so why not take that route?" In another recording, Simpson seemed to reference US wars in Iraq and Afghanistan. "They trying to bring democracy over there man, they’re trying to make them live by man-made laws, not by Allah’s laws. That’s why they get fought. You try to make us become slaves to man? No we slave to Allah, we going to fight you to the death." Despite the multitude of recorded conversations, federal prosecutors could only get him on one charge, lying to a federal agent. A judge dismissed the other terror charges based on insufficient evidence. Simpson was given three years of probation and $600 in fines and court fees, according to the Washington Post. He was likely on a no-fly list following the trial, the Morning News reported. "I have to say that I felt like these charges were completely trumped up, that they were just trying to cover up what had been a very long and expensive investigation and they just couldn't leave without some sort of charges," Kristina Sitton, Simpson's attorney, told the Associated Press. Sitton said she never thought he was capable of violence and assumed he “snapped” before his actions in Garland. More recent, Simpson was active on social media, garnering the FBI's attention for his private Twitter messages. "Soon you won't be able to live in America as a Muslim. The noose is tightening," he wrote in a March 14 message tracked by the FBI and obtained by ABC News. He wrote in early April about plans to travel to Syria to join the jihadist group Islamic State (IS, formerly ISIS or ISIL) and recruited others to join him. Those travel plans were curbed, however, when the FBI arrested people in San Diego and Minneapolis who wanted to go with him, he said. In late April, he referenced the Muhammad drawing contest, writing: "When will they ever learn?" Islamic State took credit for Simpson and Soofi’s actions in a statement aired Tuesday on its Al-Bayan radio station, according to SITE Intelligence Group. William McCants, an expert on Islamic militants at the Brookings Institution, told the Post it is "a little tricky" to determine Islamic State was related to the Garland attack. The first American to be convicted of trying to join the Islamic State was sentenced to four years in federal prison in January, though the teenage Muslim convert said she was manipulated. Three other female teenagers from Colorado were caught late last year attempting to join Islamic State. Late last summer, two Minnesotans were reportedly killed fighting alongside Islamic State. Simpson and Soofi attended the Islamic Community Center of Phoenix, according to reports. The mosque’s leader said Simpson curtailed his visits following his arrest. Shami also said that most people knew Deng, the FBI informant, was working for law enforcement, as he showed little interest in Islam. In a statement released late Monday, Simpson’s family said they were "struggling to understand" how the attack came to be. The family added it is "heartbroken and in a state of deep shock" and that it sends prayers to those affected by this "act of senseless violence," especially the wounded security guard. She said she last spoke to him last month when she wished her grandson a happy birthday. The American Freedom Defense Initiative created the ‘Mohammed Art Exhibition and Contest’ after the Charlie Hebdo attacks in Paris in January following depictions of Muhammad that appeared in the satirical newspaper. The organization’s head, Pamela Gellar, blamed Islamic State for the attack.